Last weekend I took my two youngest kids on a contemporary pilgrimage to collect relics of the demigods. This was not any common or every day event, this one was select: an event for the inner circle, those few thousand who are Crusaders/Canterbury season ticket holders. We were to be allowed close, dignified and controlled access to the demigods who would await our homage, supply relics, feed us and dismiss us. Having collected another family of pilgrims, we made our way to the home of the gods, Rugby Park on the edge of Merivale. The choice of the theophany was important. This is not the place whereupon the ritual of combat occurs during the season, not a large, impersonal stadium where everyone else also attends in worship, celebration, collective despair and ritualized hope. No, we were to be allowed close access in the place where they train, the place where the campaign is based and planned. It is decidedly low key, homely even, with a grassy embankment opposite the small, intimate grandstand, a mechano-constructed commentary box and is ringed with deciduous trees: chestnuts, elms and other english imports. This is the romanticized vision and present heritage memory of what rugby was meant to be. 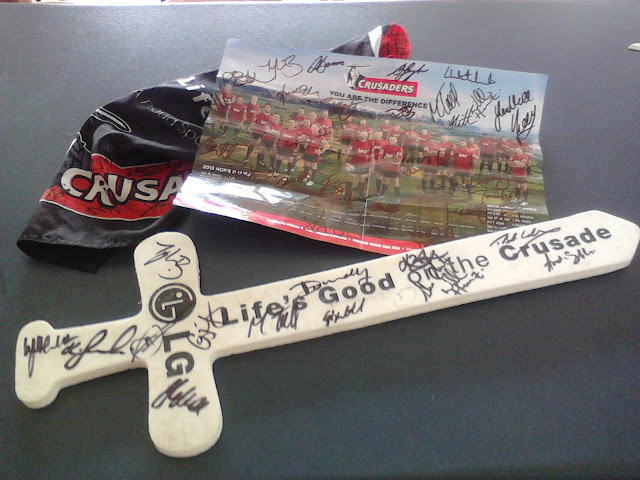 It signals that while the Crusaders are really a business, a corporate entity in the multi-million global brand of super rugby, at heart we are meant to see them, experience them and support them as a community club, that symbolizes all those 'good, honest' memories and experiences of grass-roots, school and club rugby. 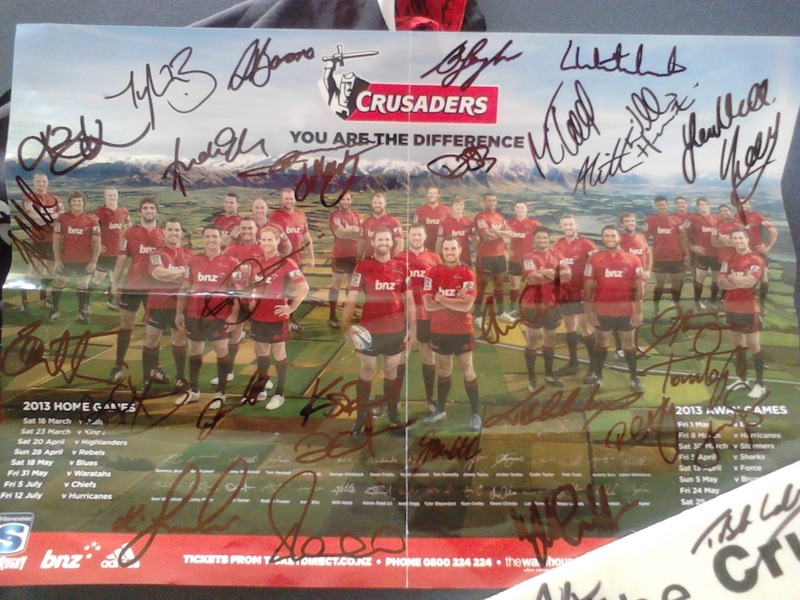 This was the Crusaders saying, "We are your club. We open our home to you and offer you hospitality." This is how and why we found ourselves lined up along the green corrugated iron fence stretching down the footpath on Innes road on a Sunday morning. Those of other devotions were worshipping elsewhere that morning, yet unlike them we were guaranteed the theophany, the experience of real presence. The objects of our worship and devotions were to be fully present, were to interact with us, if even for a brief couple of seconds. This was what the Hindus call darshan - whereupon in the act of seeing the god the god sees us and we gain a blessing. Moreover we were to be granted relics that signalled we had been in the presence of the demigods, that the event was one of real presence. All this with bread and sausage and cold drink- it was big and little kids idea of heaven. The lining up down the street was important for those of us old enough to remember having to queue up along corrugated iron fences to enter games. There was that peculiar smell of warming paint on corrugated iron, that echoing rumble of scattered conversation that reflects off the fence as the crowd stirs in expectation. As the anticipation grows and parents check their watches at children's requests suddenly the gate opens and in we file, as orderly as excitement allows, having to show our email rsvps as evidence of our piety and right to be there. Inside the conversation buzz elevates as first Aaron Mauger, looking little changed from his playing days, is sighted handing out the team photo sheet. Then, a silver head above the rest of the crowd is spotted: Todd Blackadder. He stands at the door to the marquee, pen in hand, brief responses at the ready, the first to sign, the first to be encountered, the coach who acts as sentry, high priest and totem. Younger members of the crowd, which now stretches back over 100 metres inside the ground are informed by their parents as to who exactly Mauger and Blackadder are. You become suddenly aware of the brevity of fame, of the contemporary currency of what being an All Black entails. For most of the crowd it appears that 'All Black' is only ever a current identity and not a long-term aura. That is, 'All Black' is the current wearer of the black jersey, moreso, is the one who plays rugby on TV, the one who appears in the advertisements. Once media presence is over so is the currency of 'All Black'. It is only the older fans who still venerate the player and not just the media image. It was not just his imposing physical presence, it was the presence of someone who has spent twenty-five years in the public arena, someone who learned to live in the experience of public reaction and response, someone who knew that he occupied a special place in society, and more so carried a series of responses and expectations, knowledge and falsehoods around with him for the rest of his life. The witty and pithy Richard Low of re-Union is, for many, a far cry it seems from the on-field player that was. The Richard Low in dapper dress, chatting comfortably with friends and acquaintances, aware yet oblivious to the glances and comments is and yet is not the eye-gouging, nose-breaking enforcer of days past. For many this latter Low is the real Low, however there still remains the media images of reckless brutality of the younger Low as player. Yet this tension, of real and media, of presence and present, of past and ageing, is what makes the open day so poignant. For inside the tent, sitting behind trestles, pens in hand are the current Crusaders team. Here, in close proximity, in shyness, brashness, feigned and real interest, engaging and slightly distant, articulate and shyly gruff are the young men upon who reside our hopes and dreams, our frustrations and exhilaration.The crowd is not only parents with children, it also includes teenagers with studied coolness, excitable singles, ageing long-term Canterbury stalwarts who have spent most of their supporting days pre-Super Rugby, and then, as with any holy site, any pilgrimage, the crazed, the suffering and the tragic. The collection of relics begins: team sheets are passed from player to player along the table to be signed. Arms, jerseys, swords and capes are all presented to be inscribed with the mostly often illegible signatures. One does not have to be able to decipher the signature, it is enough in itself to possess it. Young children in particular all receive a very positive welcome and comment. Chuckles occur as my three year loudly comments: "they don't look so big sitting down". Others get photographs of players, photographs with players, the new tourist postcard of the sign of the real: I did 'meet them', here is the image to 'prove' the truth of the claim. These are just young men in red jerseys sitting in a tent on a Sunday morning. They are bigger, more thickset than the average, but they are just young men who have had a series of expectations thrust upon them because of athletic ability combined with a certain temperament. The crowds who are usually kept distant are here allowed over that fence- both 'imaginary' and real- that usually separates them. Here the team do have the safety of a controlled encounter with the elect who are expected to know how to behave. All encounters are kept brief by the necessity to keep the crowd filing in an orderly fashion. There is the mutual acknowledgement of the dialectic of fandom, the necessary dialectic of the fan and the player in professional sport out of which a synthetic third space occurs. This is a tightly controlled, in fact a tightly scripted encounter in which both sides understand the roles they are to play. Neither is to become engaged beyond the superficial and if the stars are expected to turn on the charisma the fans are expected to perform enthusiastic yet controlled veneration. Interestingly, there in the right hand corner, three-quarters of the way through is Dan Carter. Thinking about it, the placements appear well thought-out. As we enter, having been granted access to the sanctum by Todd Blackadder, we first encounter Andy Ellis. As a local player, as a parent, as an All Black, as a senior pro, as a player who in his success as landscape designer and now budding radio host is the closest thing to a Crusader renaissance man, Ellis is the ideal first player. He can chat with children, he understands media commitments, he is intelligent, conversational and has the aura of the All Black still lingering. We then move from the initial high ikon through a series of lesser ones along to Kieran Reid who occupies the centre of the trestles. Reid has real presence, he radiates an enthusiasm but also an engagement with the fans. It may only be a performance, but it appears that this is a pleasure for him. He has an intensity of gaze that almost stuns small children. Here is the All Black in close proximity, and whether it is something we lay upon him and respond to, or whether it is the experience of fame and expectation mixed with that unique combination of physical ability and temperament that all top athletes require, there is something that makes him stand out, something that we all seem to respond to against the rest of the team. That he is seated centre-stage, surrounded by decidedly lesser members of the team only enforces his difference. He is set apart. He is to be noted and responded to as different. He is the centre of our procession, the centre of our veneration. He is the apex and yet why is not Dan Carter next to him? The answer is obvious. It is not only that Reid is the captain and so the central totem of the team. It is obvious when one does encounter Dan Carter. This young man is charisma and presence personified. The reaction of the crowd is very much that this is the god among the demigods. He reduces previously verbose young girls to almost silent inarticulacy. He smiles and your response cannot be separated by the host of media images and occasions that the smile accompanies. He is the STAR, the gifted one; the gift in fact that they as a team have been granted, that we as fans have been allowed to encounter. We come upon him when least expected for he is not centre stage beside Reid, rather he is almost hidden, so one comes upon him almost unexpectedly. This also ensures, being seated as he is on the cusp of the final hinging right angle of the tables, that the crowd cannot hesitate too long without disrupting all who come behind. This is the holy of holys kept special, kept sacred in the original sense of set aside. We come upon him where we would least expect him to be; this may be a staged humility, a staged enforcement that this is a team whereupon the captain is central. And yet the inverse reading occurs. Carter is too special, too important, too sacred to be presented in the most obvious place. That he is so special, so different is enforced by where he sits - and the limitations it places upon our ability to engage. The one who most would wish to linger with is the one with whom it is most difficult to do so. And so then we move along the final table and there, at the end, the perfect counter balance to Andy Ellis, the perfect repository of many fans' delight and excitement, is Robbie Fruean. Unfailingly polite and engaged, constantly smiling and with a comment for all, many times a 'thank you' for, in effect, responding to the team's invitation to worship and venerate. Then we exited to the bbq sausage and bread, a choice of cold drinks and then, nothing. That was it. You could sit on the embankment and eat your sausage and drink your soft drink. Kids could run and play on the rugby field that was unfortunately just ending its sprinkler cycle and so was somewhat wet. Nothing else. A bit of chatting and a look back along the crowds still arriving to line up and file in expectation as we had just done. Looking around, adults and children clutched and wore their freshly signified relics, their evidence of being in the presence of the demigods. For what is the meaning of these scrawls in marker pen on pieces of paper, on bits of fabric, on soft plastic swords, on rugby balls. It signals firstly that you were in their real presence. The signature is the guarantor of the authentic event. The signature, as the individual identifier - whether legible or not- is taken to be the accepted record of a meeting with the one deemed so special that the name now stands in for the person. My signature is worth nothing because in the world of the fame I do not exist. The signature is proof of the existence of fame and societal meaning and value. This is why the younger, newer, lesser members of the team often seemed uncomfortable, or reticent, or joked about having so any wish to collect their signature. For its signals a shift in their identity- perhaps only seasonally fleeting. For the moment they have fame by wider association. What they signify- as a a member of the Crusaders- is more than what they embody either within that team or outside it on a daily basis. The fans who now request their handwritten proof of this player's individual identity would not wish to have it if their signer was not a part of this team. Many players would also be very aware that many who got their signature had no real idea as to who they were. Such team members are just part of the collective experience for the fan. Yet as the team was seated in such an order, we as fans had no real choice as to whether we got their signature or not. It was a demand placed upon our participation. If you want access to the stars, if you want to venerate the stars, if you want this special experience of fandom then all of the team are included. This was strictly controlled and the effect was to signal that the team is more important than its individual starts, no matter how we as fans may wish to concentrate on some over others. The lack of any alternative activity after the signing was also important. We were fed and watered, that is rewarded, for having participated. But there was nothing else to do, for what could compete with the experience of real presence? So we left, enthused, excited, in anticipation of the season ahead. We left feeling that we had been part of something special, something important yet not really aware of why and how. But what it was is simple. It was the pilgrimage and ritual of the relics of fandom.